In a blender or food processor, combine the Marinade & BBQ Sauce ingredients, except the ketchup and molasses. Blend till smooth, scraping down the sides of the bowl as needed. Add the chicken to the bag of marinade. Seal the bag and gently turn it so the chicken gets completely coated in marinade. Refrigerate for at least 2 hours or overnight. Remove the bag from the fridge 30 minutes before grilling. Cut each piece of chicken into 4. Throw out the marinade. Thread the chicken onto metal skewers, or bamboo skewers that have been soaked for at least two hours. Set aside. Combine bourbon, maple syrup and lemon juice in a bowl. Cut the fruit in half, remove the peel and the pits. Toss the fruit in the bourbon mixture. Heat grill to medium-high and spray with non-stick cooking spray. Grill skewers for 10 - 12 minutes, basting with the BBQ sauce and turning often to keep from sticking or burning. Halfway through grilling the skewers, add the fruit, cut side down. 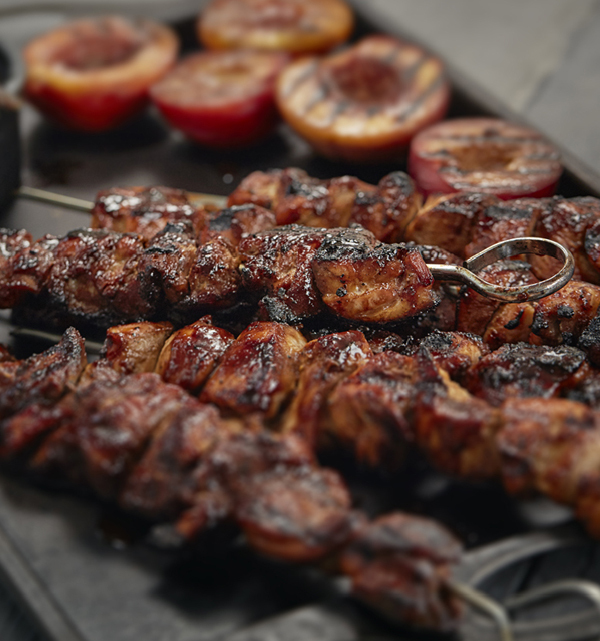 Take the skewers off the grill when the chicken reaches 170F on a digital meat thermometer. Remove the fruit when it's fork tender. Serve the skewers with the fruit, and other summer favorites like corn on the cob.